SAN FRANCISCO — Maxim de Jong often begins his day by scaling 2,100 meters up Mount Cheam near his home in Chilliwack, British Columbia, jumping from the peak and gliding back to the base on a miniature paraglider. In June 2013, de Jong followed that route four times, setting an unofficial world record for the greatest vertical distance traveled in a single day. De Jong’s love of climbing and paragliding prompted him to establish Thin Red Line, a company focused initially on consulting with police departments, firefighters and SWAT teams on tactics and equipment. Eventually, the company began designing its own equipment. “I would see these situations where rescue teams needed to travel to remote areas and think, ‘Wouldn’t it be great if the equipment didn’t weigh so much?’ or ‘What if there was a life-support harness that could keep you alive if you were unconscious?’’’ de Jong said. It was Bally Ribbon Mills that put Bigelow Aerospace in touch with Thin Red Line when Bigelow was having trouble finding materials strong enough for straps to connect the company’s inflatable habitat to a space module’s metal bulkhead. For six months, Thin Red Line supplied numerous materials for Bigelow to test. 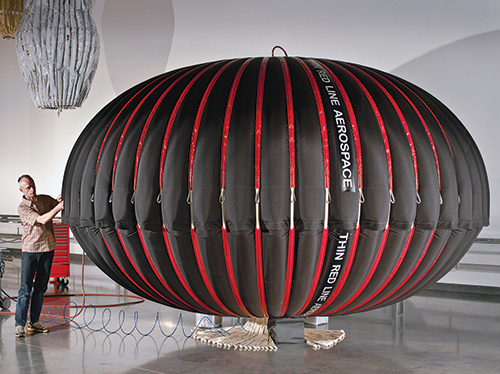 At the end of that period, Bigelow hired the company to work on Genesis 1 and Genesis 2, the inflatable habitats launched in 2006 and 2007, respectively, to serve as prototypes for commercial orbital outposts. Thin Red Line supplied Bigelow with 20 inflatable pressure shells of various sizes. The largest had a volume of 320 cubic meters, de Jong said. “Thin Red Line conducted work and stitching on the Genesis restraint layers,” said Mike Gold, director of Washington operations for North Las Vegas, Nevada-based Bigelow. After completing work on the Genesis program, de Jong conducted extensive research into new ways to design and build inflatable structures that could be scaled to various sizes. De Jong also devised mathematical techniques to predict how those structures would respond to external forces. Those efforts led to contracts from NASA and collaboration with space agency contractors, including Paragon Space Development Corp. of Tucson, Arizona, Lockheed Martin Space Systems of Sunnyvale, California, and St. Louis-based Boeing Defense, Space & Security, to explore the use of Thin Red Line’s inflatable Ultra High Performance Vessel for use as a habitat or storage tank for cryogenic rocket fuels. More recently, Thin Red Line has delved into the field of planetary decelerators working with NASA Ames Research Center in Mountain View, California, on Adaptable Deployable Entry Placement Technology (ADEPT), an effort to develop deployable technologies for outer-planet entry, descent and landing. Once again, Thin Red Line applied the expertise developed while working with rescue equipment to NASA projects. ADEPT program officials declined to comment. In the March-April 2014 issue of the NASA publication “Space Technology: Game Changing Development Highlights,” Steve Gaddis, Space Technology Game Changing Development program manager at NASA’s Langley Research Center in Hampton, Virginia, said arc jet testing conducted in February confirmed that the seams Thin Red Line sewed with carbon thread stood up to high heat. Arc jet testing simulates the extremely high temperatures spacecraft encounter. In addition, Thin Red Line is working with Langley Research Center to explore the use of new, high-strength materials for use in the Heatshield for Extreme Entry Environments Technology project, which develops woven thermal protection system technologies for possible use on sample-return missions as well as exploration of Venus, Saturn or Uranus. In collaboration with the ISTAR Group of Bend, Oregon, Thin Red Line won a Small Business Innovative Research contract in June to design a midaltitude balloon for Venus. The balloon, which would have a diameter of 5.5 meters, would drift over Venus at an altitude of approximately 50 kilometers. “What I would like to see is a decelerator that turns into a parachute before the bottom membrane unfolds to create a balloon that drifts around at midaltitude,” de Jong said. To some people, that idea might sound crazy. However, de Jong embraces the idea that innovation lies in the space between what is considered possible and impossible or crazy and sane. “Extremism, passion and bravery touch upon elements of what conventional reason would consider insanity,” de Jong said. He adopted his company’s name Thin Red Line after the allusion in Rudyard Kipling’s Crimean war poem “Tommy” to the advancing line of redcoats succeeding in battle against the much larger Russian cavalry.